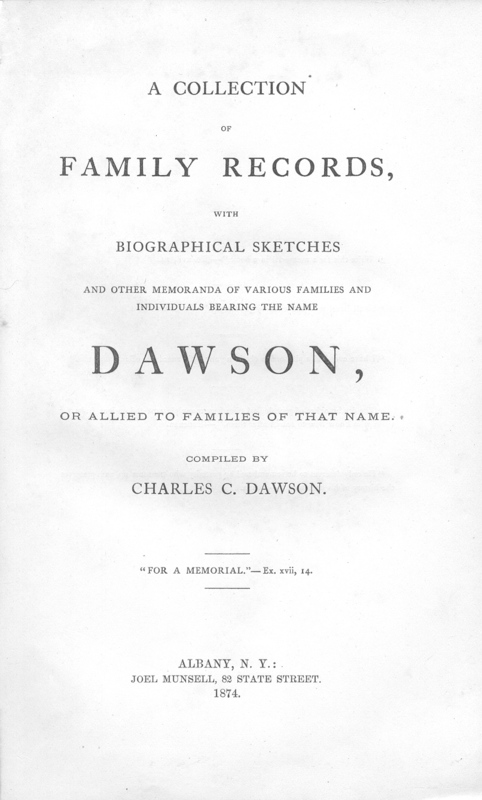 The book, "A Collection of Family Records with Biographical Sketches and Other Memoranda of Various Families and Individuals Bearing the Name Dawson, or Allied to Families of That Name," by Charles C. Dawson, 1874, Albany, New York, Joel Munsell - printer. It is filled with genealogy data about various Dawson's and allied families. Please note: This is not a paper book, it is a scan of the original paper book into the digital Adobe PDF format, written on a CD-ROM. You read this book on your computer using the free Adobe Reader software. It is a digital version of a hard to find book. If you could find a copy of the 1874 printed book, it would be very expensive. New England: Notes relating to early Dawson settlers. Family of Robert Dawson of East Haven, Connecticut. Family of Thomas Dawson of New Haven, Connecticut. Family of John Dawson of Monroe, Connecticut. Family of Peter Dawson of Barnet, Vermont. Family of Henry Dawson of Milbury, Massachusetts and Broad Brook, Connecticut. New York: Notes relating to early Dawson settlers. Family of Henry Dawson of Long Island, New York. Family of Roper Dawson of Staten Island and New York. 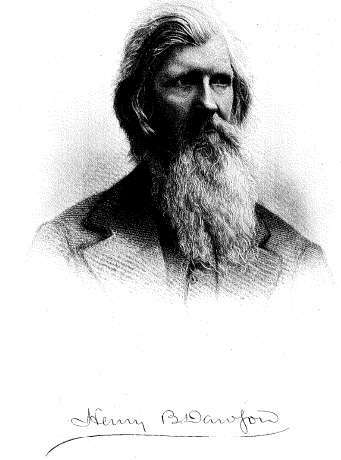 Family of George Dawson of New York & Michigan. Family of Benjamin F. Dawson of New York. Family of Abraham Dawson of New York City and Ithaca, New York. Family of Henry Dawson of Brooklyn and Cohoes, New York. Families of James & Thomas Dawson of New York. Families of John & James S. Dawson of Brooklyn, New York. Family of Henry Hodgeson Dawson of Syracuse, New York. New Jersey: Family of Francis Dawson of Burlington County, New Jersey. Pennsylvania: Notes relating to early Dawson settlers. Family of Robert Dawson of Philadelphia, Pennsylvania. Family of Elias Dawson of Philadelphia, Pennsylvania. Family of James Dawson of Cumberland County and Washington County, Pennsylvania. Family of Robert Dawson of Westmoreland County and Washington County, Pennsylvania. Family of William Dawson of Westmoreland County, Pennsylvania. Family of John Dawson of Solesbury, Pennsylvania. Family of John Dawson of Hatsboro and Philadelphia, Pennsylvania. Family of John Dawson of Northumberland County, Pennsylvania. Maryland: Family of Ralph Dawson of Talbot County, Maryland. Family of John Dawson of Prince George County, Maryland. Family of John Dawson of Alleghany County, Maryland. Family of William Dawson of Caroline County, Maryland. Family of Philemon Dawson of Dorchester County, Maryland. Family of Robert Dawson of Dorchester County, Maryland. Family of Nicholas Dawson of Talbot County, Maryland. Family of Sovran Dawson of Caroline County, Maryland. Family of John Dawson of Charles County, Maryland. Family of Frances Dawson of Talbot County, Maryland. District of Columbia: Family of Geo. 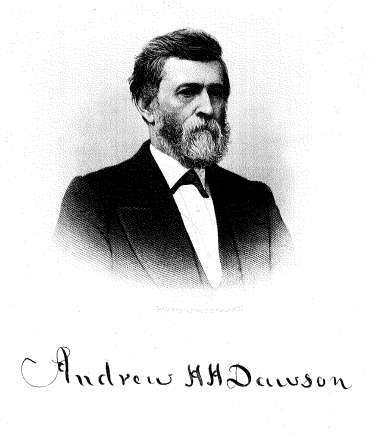 Francis Dawson of Washington, D.C. Virginia: Family of Martin Dawson of Amherst County, Virginia. Family of John Dawson of Stafford County, Virginia. Family of John Dawson of Northumberland County, Virginia. 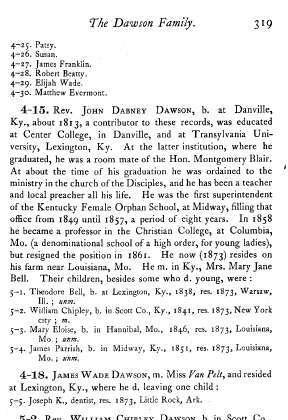 Family of Benjamin Dawson of Virginia. Family of William R. Dawson of Virginia. Family of John Dawson of Bedford County, Virginia. Family of William Henry Dawson of Blacksburg, Virginia. List of Virginians in the War of 1812-14. List of Confederate Dead, Richmond, Virginia. 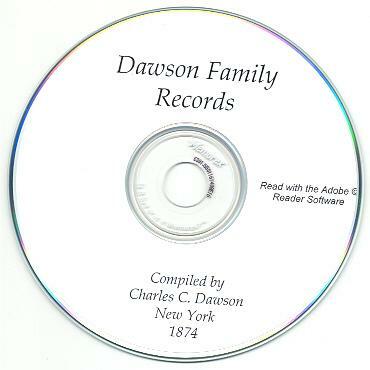 North Carolina: Family of John Dawson, North Carolina, 1754-1765. Family of Robert Dawson of Onslow County, North Carolina. South Carolina: Family of John Dawson of Charleston, South Carolina. Family of Rev. Thomas Dawson of Pendleton, South Carolina. Georgia: Family of George Dawson of Green County, Georgia. Family of John Edmonds Dawson of Washington County, Georgia. Louisiana Dawsons. Ohio: Family of John Dawson of Green County, Ohio. Family of Moses Dawson of Cincinnati, Ohio. Family of Robert Dawson of Cuyahoga County, Ohio. Canadian Dawsons. List of Dawson & related Union soldiers interred in National Cemeteries, etc.